No more droughts skin and split ends! The Organic Shea butter Cattier perfume Fleur des Iles is a true multi-function: it nourishes, repairs and protects the face, body and hair. Naturally rich in vitamins A, D, E and F, it intensely hydrates the epidermis, prevents dry skin, promotes cell renewal while protecting your skin from external aggressions. 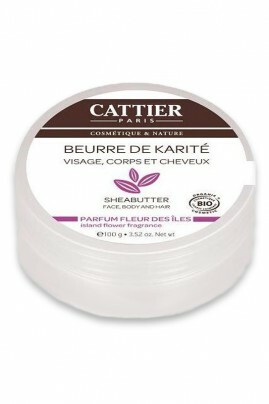 The rich formula of Shea Butter Bio CATTIER, is known for its restorative, anti-drying and protective. Let yourself be carried away by the exotic delicate flowery fragrance that is a true invitation to travel! Intense hydration with Shea Butter Organic Perfume Flower Cattier Islands!